“Mean to Me.” Words by Roy Turk, music by Fred E. Ahlert (1929). Recorded by Elsie Carlisle, accompanied by Jay Wilbur and His Orchestra (uncredited) c. late June 1929. Dominion A. 168. The torch song “Mean to Me” is perhaps the most familiar of the many pieces resulting from the collaboration of composer Fred E. Ahlert and lyricist Roy Turk. Whereas many dance bands’ versions of this comparatively morose song are paradoxically upbeat, Elsie Carlisle’s version is marked by considerable pathos and fidelity to the sentiments of the lyrics. As is often the case with Elsie’s renditions of popular music, there is a dramatic element present in her “Mean to Me” that sets it aside from other recordings. 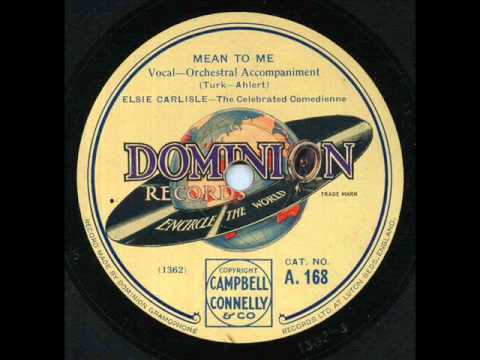 By mid-1929, “Mean to Me” had become a common anthem of the British dance bands, with recordings by Jack Hylton and His Orchestra (vocalist Sam Browne), Ambrose and His Orchestra, Alfredo’s Band (vocalist Eddie Collis), Nat Star and His Dance Orchestra (as Eugene Brockman’s Dance Orchestra), Harry Bidgood’s Manhattan Melody Makers (with vocals by Mabel Mann), Carroll Gibbons and His Playmates (with vocalist Alma Vane), Tommy Kinsman’s Florida Club Dance Band, Jay Wilbur and His Orchestra (Lou Abelardo, vocalist), Jim Kelleher’s Picadilly Band (vocalist Fred Douglas), Hal Swain’s Café Royal Band (with vocals by Hal Swain himself, Jimmy Redmond, and Cecil Woods), Bidgood’s Broadcasters (as the Midnight Merrymakers, with Tom Barratt singing), Bert and John Firman’s Arcadians Dance Orchestra (with vocals by Maurice Elwin), and Cecil and Leslie Norman’s Savoy Plaza Band (with vocals by Cavan O’Connor). “Mean to Me” notably appears in the 1932 Betty Boop cartoon Minnie the Moocher (listen for it at 2:53, although be sure not to skip Cab Calloway’s remarkable dancing at the beginning of the short).